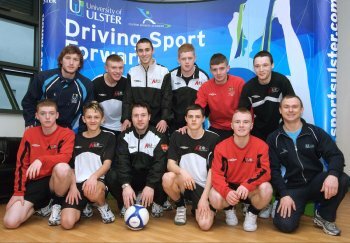 The University of Ulster is giving a groundbreaking soccer initiative a helping hand, thanks to its Performance Services Unit. Academy North is a soccer apprenticeship programme developed by north Belfast’s Cliftonville FC and Crusaders FC, together with North City Training a member of Bryson Charitable Group. The initiative gives 11 promising soccer players aged between 16 and 18, from the clubs’ junior ranks the chance to develop their football skills while continuing education and personal development. The talented youths have been coming to the Jordanstown campus to benefit form the world-class expertise and state-of-the-art training facilities. William Moore, Performance Services Officer, said: “The footballers are individually assessed at the University and are provided with tailor-made strength and conditioning programmes that will allow them to develop physically and assist them in becoming better players. Part of the project also involves a period of placement with a soccer club, involving club training, coaching at community programmes, soccer camps and primary schools. Academy North is a pilot Soccer Apprenticeship programme. Cliftonville and Crusaders Football Clubs, together with North City Training, a member of Bryson Charitable Group, have developed this new sports and educational training programme through the Department for Employment and Learning’s Training for Success provision.